Wild Garlic is a herbaceous perennial with glabrous, thick, broad leaves. Each plant can have up to twenty leaves sprouting from a single stalk. Small white flowers are clustered at the end of a long stem. Wild Garlic grows widely in rural and urban ecosystems all over Europe. The plant thrives in damp ground and prefers to grow in shady areas. 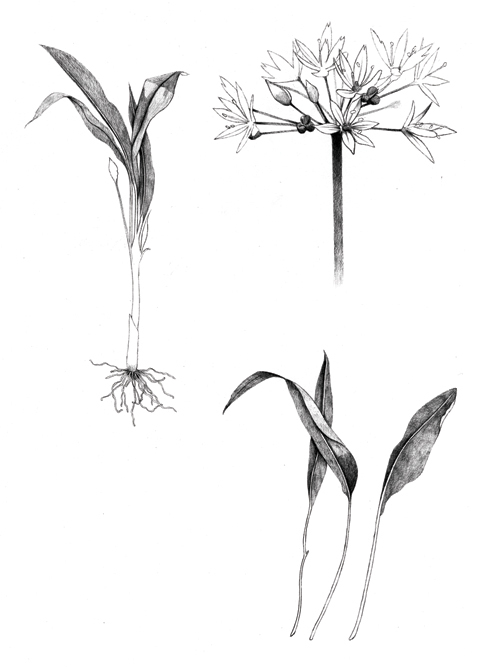 The Latin name Allium ursinum means ‘bear garlic’ as brown bears like the eating the bulbs. Wild Garlic has been historically known and used in the diet of numerous European countries. The species, especially when without flowers, can be easily confused with other plants such as Lily of the Valley or Arum maculatum, that are poisonous and potentially deadly. Incidents due to misidentification occur almost every year. WARNING - Wild Garlic leaves can be easily confused with Convallaria majalis, Arum maculatum and Crocus autumnalis all poisonous plants, with potential deadly consequences. The leaves of Allium ursinum will release a garlic-like smell when you grind the leaves between your fingers. Hatfield, G. Encyclopedia of Folk Medicine: Old World and New World Traditions. (ABC-CLIO, 2004). Reuter, H. D. Allium sativum and Allium ursinum: part 2 pharmacology and medicinal application. Phytomedicine 2, 73–91 (1995). Preuss, H. G., Clouatre, D., Mohamadi, A. & Jarrell, S. T. Wild garlic has a greater effect than regular garlic on blood pressure and blood chemistries of rats. Int. Urol. Nephrol. 32, 525–530 (2001). Ebadi Manuchair 2007 Pharmacodynamics basis of herbal medicine. Taylor & Francis Group LLC. Schults, Hänsle, Blumental, Tyler 2004, Rational Phytotherapy. Springer Berlin.